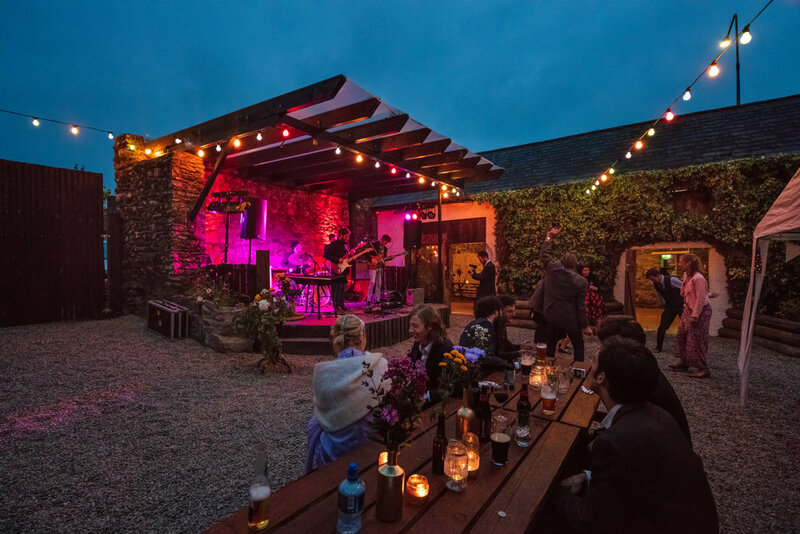 O'Mahony's of Watergrasshill is a family-run country pub and food venue in North Cork. We've been looking after our customers for over 200 years and we now serve our popular evening menu every Friday, Saturday and Sunday from 6 – 9pm. Our focus is to serve great beer, wine, coffee and food that we enjoy making and sharing. We pride ourselves on using fresh, local and seasonal Irish produce. We're only 10 minutes from the Dunkettle Interchange. Come see what all the fuss is about! At O'Mahony's of Watergrasshill we use the best of fresh, seasonal ingredients from local producers, growers, butchers and fishmongers. Take a look at our menus here to get an idea of what you can expect when you dine with us. Previous proprietor, Ned O’Riordan, on Fair Day. At O'Mahonys of Watergrasshill we endeavour to use the best of local, seasonal produce. We are very lucky to work with an amazing collection of suppliers providing us with such high-quality produce. Kilbrack use traditional organic farming practices and always pick their produce fresh for orders. They are certified with IOFGA as fully accredited Organic producers. O'Mahony's are based in Cork City's world famous English Market. They provide their own Beef and Lamb from their family farm in Ballea, Co. Cork and all of their produce comes from County Cork. Established in 1985, Ballycotton Seafood is a family owned and run fish and seafood business in the world famous English Market in Cork City. They catch and land fresh fish daily using their own boats to provide us with the very best. Based in a tiny cottage on the grounds of Ballymaloe House, the Golden Bean's goal has always been to source, roast and supply the most ethically produced beans from around the world and we are delighted to make our coffee with them. Wolfgang and Agnes Schliebitz provide us with their own beautiful Knockalara Sheep's Cheese as well as sourcing other beautiful locally-produced cheeses like Cashel Blue, Coolea, Killeen Goats cheese, Knockanore, Gubbeen and Cáis na Tíre. The Ferguson family have worked Gubbeen Farm for many generations and now provide us with amazing charcuterie. The pigs are born at the farm, the sows having grazed the pasture all summer long and the young being born down at the farm. They are fattened-on in large, airy, straw filled pens overlooking the Atlantic with one wall open to the fresh air and the fields. Olives West Cork has been supplying a wide range of artisan products and Mediterranean fare for well over 10 years. They source and provide us with a wide array of beautiful products including Macroom buffalo cheeses. Caroline and Eddie Robinson have been vegetable growers for many years. Since 1996, they have been working a 30-acre farm near Bandon. They provide us with beautiful, seasonal organic fruits and vegetables from their Saturday stall in the Coal Quay Market. Clonmore Goat's Cheese and Shandrum Farmhouse Cheese are handmade by Tom, Lena and Linda Biggane on their farm. The milk, which is pasteurised, comes from their own herd of cows and goats. Their cheeses are not made in the winter meaning they are only made with milk from outdoor, grass-fed, cows and goats. 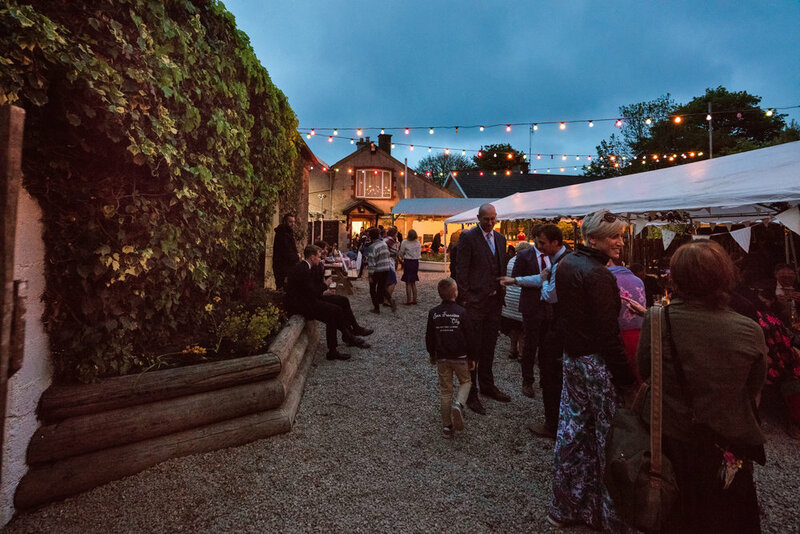 With Granny's Garden, the Bar, The Courtyard and our newly renovated The Long Room there are lots of different areas and spaces to suit all sizes of celebrations and wide range of menus to suit all types of event.